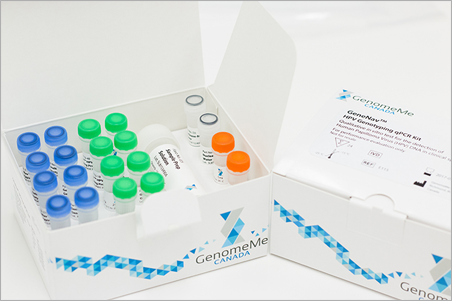 The GeneNav™ HPV Genotyping qPCR Kit is designed for continuous monitoring of individuals who have been confirmed to be HPV positive with one of the 14 High Risk human papilloma virus (HPV) subtypes. This kit allows physicians to track patients who are at a greater risk of developing cervical cancer by identifying individuals who show persistent infection with the same HPV subtype. This in vitro diagnostic kit allows for the specific detection and discrimination of all 14 High Risk HPV subtypes: HPV 31, HPV 33, HPV 35, HPV 39, HPV 45, HPV 51, HPV 52, HPV 56, HPV 58, HPV 59, HPV 66, and HPV 68. A β-Actin internal control is also used in the GeneNav™ HPV Genotyping qPCR Kit to assess specimen quality and ensure the reliability of the HPV detection results. The GeneNav™ HPV Genotyping qPCR Kit uses probe-based qPCR technology to detect HPV with high specificity. Each sequence-specific probe contains a 5’ fluorophore and a 3’ quencher. On its own, the probe’s 3’ quencher effectively absorbs the emission from the nearby 5’ fluorophore so that no net fluorescence is detected. During PCR amplification, the probe binds to its specific target template. While replicating the DNA sample, the PCR Taq Polymerase’s 5’ to 3’ exonuclease activity also hydrolyzes the probe, releasing a free-floating 5’-fluorophore that is detectable by the qPCR machine and can be translated into an amplification plot. In this HPV Genotyping qPCR kit, the 14 types of high risk HPV and a human β-Actin control are divided into 8 reaction tubes, with 2 fluorescent channels per tube: FAM and HEX. Detection of a positive signal in a particular channel can identify a specific genotype of HPV. An internal control, β-Actin, indicates the quality of extracted DNA. The GeneNav™ HPV Genotyping qPCR Kit is a qualitative in vitro diagnostic test that detects all 14 high risk HPV subtypes: HPV 31, HPV 33, HPV 35, HPV 39, HPV 45, HPV 51, HPV 52, HPV 56, HPV 58, HPV 59, HPV 66, and HPV 68) at clinically relevant infection levels from cervical swab specimens. Cross reaction among these 14 HPV types was not observed. A panel of bacteria, fungi, and viruses commonly found in the female anogenital tract were tested with the GeneNavTM HPV Genotyping qPCR Kit to assess potential cross-reactivity. The pathogens tested include: Candida albicans, Proteus vulgaris, Corynebacterium pseudodiptheriticum, Staphylococcus aureus, Enterococcus faecalis, Staphylococcus epidermidis, Escherichia coli, Streptococcus mitis, Lactobacillus acidophilus, Streptococcus pyogenes, Herpes simplex virus, type 1 and 2 (HSV-1 and 2), Chlamydia trachomatis, Neisseria gonorrhoeae, Human Immunodeficiency Virus type 1 (HIV-1 pol and env regions), and Mycoplasma hominis. Negative results were obtained from all above-mentioned organisms. Reproducibility of the GeneNav™ HPV Genotyping qPCR Kit was assessed at two external sites using a panel of HPV positive and negative cultured cells and HPV positive and negative cervical specimens. DNA was extracted from 500 μl of cervical samples or cultured cells suspended in Specimen Transportation Medium. The DNA was extracted using the sample prep solution included in this Kit. DNA was extracted from sixteen samples and tested with GeneNav™ HPV Genotyping qPCR Kit at two sites on non-consecutive days within a two-week time period. 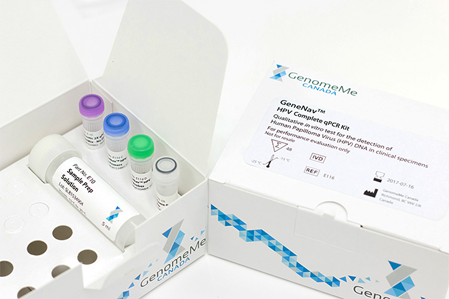 Two lots of GeneNav™ HPV Genotyping qPCR Kits were used across the two sites for the study. The total number of measurements for each sample was 20 (2 sites x 5 days x 2 lots x 1 run per day). The results showed that the coefficient of variation (CV) for the kit performance was less than 5% among different product lots and different operators.